Casa Bella Bahia is a lovely seaside home perched on the hill overlooking San Juan del Sur and it’s iconic horseshoe shaped bay. This turn-key 5 bed / 4.5 bath villa offers not only spectacular views, but also a design and fluidity throughout that instills a sense of comfortability and contentment as you meander through the hallways and multiple levels of this unique home. As you come up the steps from the parking area and into the front yard you are immediately invited by the green grass, cascading pool, and open living area with full bar. The whitewashed exterior mixed with the use of fine Nicaragua hardwoods gives this home a timeless look while being faithful to a traditional Mediterranean style. Just off the open living room we find the kitchen with the best view in town and a dining area with a beautiful table perfect for family dinners and special occasions. The main house has 3 bedrooms in total, each with it’s own bathroom. The master bedroom can be found on the second story and it boasts it’s own private balcony. Casa Bella Bahia also has an additional 1-bedroom loft style bungalow with a large living area on the first floor and a loft bedroom above – perfect for visitors or as an income-producing sublet! 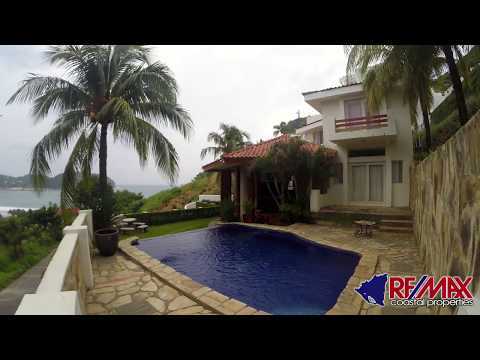 Casa Bella Bahía is located in Pacific Marlin – the most exclusive residential community in San Juan del Sur. Located just a quick walk up the hill to the famous Cristo de la Misericordia Statue and a 5-minute jog down to the beach, this is a hard-to-beat location and you and your family will be able to enjoy privacy, security and tranquility while enjoying the front-seat on this ride to paradise! Casa Bella Bahia is being offered fully-furnished and ready for a new owner. Whether you’re looking to own a primary residence, vacation home, or rental-income producing property – Bella Bahia has it all! Come and take a look today!